I remember when I first met Giselle, I thought she had an interesting take on death. She told me she had a great relationship with death and I thought that was pretty weird. Most people don’t talk about death and here she was saying she has a great relationship with death. 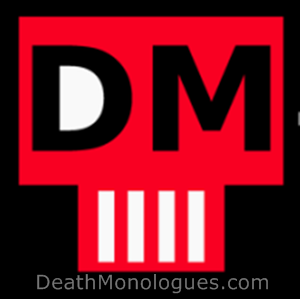 That is the whole point behind The Death Monologues. She wants to help other people understand and have a great relationship with death too. We live in a death phobic society even though everyone will have to face death at some point. Giselle says it best…. From DeathMonologues.com – Our goal with THE DEATH MONOLOGUES is to take it out into the world to the people and places that would appreciate its profound message, places such as theaters, hospice homes, cancer centers, hospitals, schools and prisons, and provide a platform to open up the conversation on the subject and help transform the way we view and experience death and dying in our culture. Death is a subject that permeates the life of every single human being and yet is rarely approached, and even more rare, approached in this way. The experience of this show will allow us to embrace our lives more fully and free us from the fear, bringing peace and understanding in its place. I can say that even though it was not something I was looking for, my thoughts on death have changed since I met Giselle. I am not near as frightened of it as I used to be. I am not sure I am ready to say I have a great relationship yet, but I am certainly better off than I used to be. I think it is about time that we all stop being afraid of and not discussing the one thing we know we will all face, death. Death is not our enemy, Fear is. Fear of the unknown, Fear of talking about it, Fear of facing it. Giselle is offering a way for us to face that fear and move forward to living life fully and freely. I know that Giselle is embarking on is a journey that will change her life and the lives of many others and I am so proud of her for following her heart in a way that is going to help many people.